I’ve spoken earlier in my pregnancy about my exercise routine and how I’m incorporating that into my pregnancy. I managed to continue going to barre class about twice a week until the end of October, when I was about 34 weeks pregnant. Since then, I’ve continued to walk most days, and have tried to make time to do some yoga every week. I will admit, I did find it a bit more difficult to motivate myself to exercise since I stopped having the accountability and scheduling of the barre class. 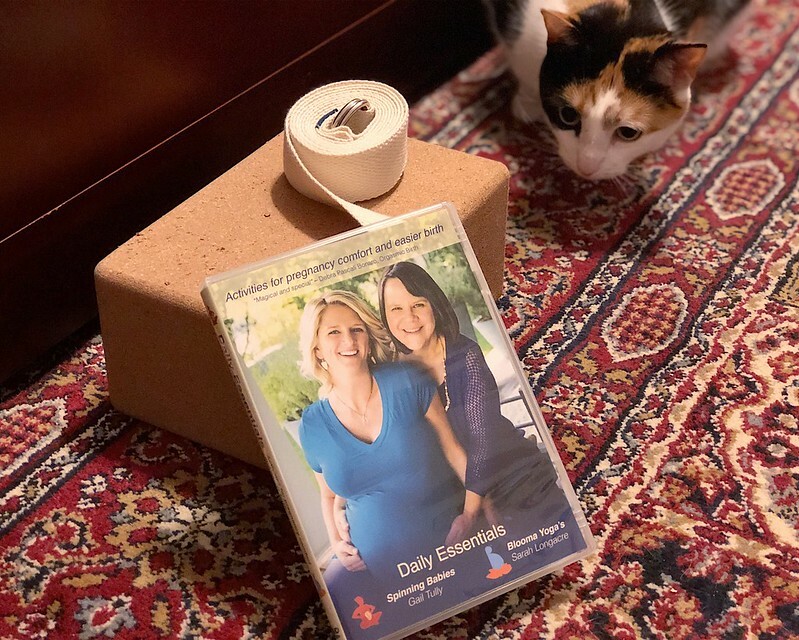 I mentioned in my weekly update that my doula has lent us a copy of the Spinning Babies Daily Essentials DVD to use for the last few weeks of my pregnancy and it’s definitely helped re-invigorate my workout routine. So the first few weeks of November, when I officially cancelled my gym membership, I gave myself permission to be a little lazy. I mean, I still had to walk a fair amount, since I walk about 50 minutes, round trip, to get to and from work four days a week. And I tried to make sure I got in at least one more day per week of walking, usually our weekly trip to Vigilante Coffee. So I was still averaging over two miles per day of walking, though it was more like 3.5 miles five days a week, rather than a couple miles every day. But after I got the Spinning Babies DVD, I made more of an effort to work on stretching and strengthening exercises from that DVD. The difference between that and my workouts before is that now I definitely see my goals as explicitly preparing for childbirth, rather than for general fitness. My doctor has even reminded me to walk for a half an hour every day, so I’m trying to make sure to fit in some walking time every day, even when I don’t walk to work. It helps that we have some lovely walking trails nearby. And then, I do yoga and Spinning Babies exercises. I can do the full 35-minute Daily Exercises routine or the 28-minute yoga flow from the DVD when I have the time and energy, but I try to do a little every day, even if it’s just my favorite 3-4 exercises. And my Hypnobabies course actually recommends doing a small set of exercises everyday. So I do my pelvic tilts, squats, and butterfly stretch every day to keep my body supple and ready for childbirth, while windmills help release the lower back pain that has crept up as I’ve gotten bigger. Unfortunately, I had to stop doing forward-leaning inversions when my acid reflux got bad. But I notice that my body feels better when I do these exercises more consistently. Plus, I can still do my weekly lunchtime yoga class at work, since the instructor is a coworkers of mine and the class is small enough that she can tailor it to our needs. In this way, I’m helping keep my body flexible and supple, and my mind quiet and prepared for the rigors of childbirth. I’m not going to be running any marathons soon, but I am preparing for the next endurance event on my schedule. You guys, I’m officially considered at term. Technically, if I had this baby now, it wouldn’t be considered premature. That means I could have the baby today… or a month from now. So that’s fun. This last few-weeks-to-a-month is very “hurry up and wait.” I mean, I felt like we should probably have most things ready, just in case, but statistically, I probably have at least another few weeks to wait (probably closer to four). And my OB is in no hurry to induce me before Christmas since my pregnancy has been normal and boring so far. This week, I had my final ultrasound, where we found out the baby has grown to be just under 7 lbs. (about 75% of the cat, for those who like that tracking measure), according to the ultrasound estimate. Baby still has a huge head, and was being too shy to get a picture of the face with the 3D ultrasound. It was a little disappointing that Dan wasn’t able to see the face live on the monitor, since he missed my 30-week ultrasound, but we got such great pictures from the 30-week scan that I didn’t feel the need to poke and prod to get more this week. Plus, I mostly just cared about the growth. I also got swabbed for Group B Strep, and had a conversation about my birth preferences with the doctor. She was completely on board with all of my preferences and said that most of them were standard practice at our hospital anyway, which was nice. It was my first time meeting that particular OB in person, though we’d talked on the phone. This week was also Thanksgiving in the US, but we couldn’t really travel. We decided to get some Chinese takeout with my mother, who lives closer to our hospital than we do, but I had my “Thanksgiving dinner” last month when Dan’s college friends hosted a friendsgiving party around Canadian Thanksgiving. Honestly, Chinese food for Thanksgiving really hit the spot, and my mom made a dairy-free apple pie because Dan has been eliminating dairy this month. I’ve also started building a stash of freezer meals. Our doula had a fantastic suggestion: rather than specifically setting aside time to make a bunch of freezer meals, just make a double-portion when you’re making dinner and freeze half. That way you’re taking advantage of time you would already be spending cooking, and you can slowly build up a stash, rather than stressing over doing it all at once. So I made some beef curry in the Instant Pot this week and froze half of it, and I’ll probably try to make an effort to do that at least once a week from now on. I’m also going to freeze some chocolate chip cookie dough balls. Since I had a day off on Friday to rest, Dan suggested that we try going out on a date night on Friday, so we got a reservation at a new-ish restaurant near us that we hadn’t made it to yet: Momo Yakitori. It was fantastic. I actually can’t wait to go back when I’m not pregnant because they have some interesting alcohol offerings, too. We got a nice assortment of skewers and appetizers and just generally had a blast chatting with our server (who might have also been the owner?). Since it’s likely that I won’t feel much like going out in the next few weeks, and then our lives will get decidedly busier, it was a bit of a last hurrah. As I mentioned last week, my indigestion has turned into acid reflux. Since I started taking Zantac twice a day, that has been much better, although I’ll still get a little bit of a flare, particularly right before I’m due to take another dose. Thankfully, I’ve started with the lower dose of Zantac, so if I feel like it stops working, I can try the stronger version. I will say that I’ve been sleeping much better since starting the Zantac. Other than that, I alternate between feeling pretty good one day and pretty blah the next day. My Braxton-Hicks have started coming more often, and I just generally feel heavier every day. It’s difficult to stand up from sitting, and I’m noticing my hips getting achy more easily. Our doula lent us a Spinning Babies Daily Essentials DVD that has some good prenatal exercises on it, so I’ve been doing those once in a while and it really helps (especially since my motivation to do yoga has tanked, and the colder weather has sapped my motivation to walk when I don’t need to to get to work).